Taking a top achiever and moving him to an illogical place on the field was nothing new. Successor Cubs managers probably took the hint from Andy Pafko’s sudden shift from an All-Star center fielder in 1947 to starting third baseman after Stan Hack’s retirement 1948. Hence his nickname, “Handy Andy.” When observers saw Pafko’s hitting wasn’t outwardly affected with 26 homers, 101 RBIs and a .312 average, well, then almost anyone can move around at will. Pafko never played regularly at third again, settling in as a corner outfielder for the Brooklyn Dodgers and Milwaukee Braves through the end of the 1950s. Yet another player who did not allow a reverse shift — from third to the outfield — affect his plate work was Beltin’ Bill Melton. In his second full season as a White Sox in 1970, Melton seemed literally spooked at third — and then was jinxed by injury. In the first month of the Sox’s lost ’70 season, Melton made 12 errors at third. Everyone in the Sox camp knew he was pressing defensively. But after making an error in a night game at Baltimore’s old Memorial Stadium on May 8, 1970, he lost a ball in the lights at the last second. The ball ricocheted off the heel of his glove and smashed into his face, breaking his nose and knocking him out for an instant. Blood poured from atop his nose, from both nostrils and out of the corners of his mouth. When Melton returned to the lineup, manager Don Gutteridge supposedly gave him a break by shifting him to right field while roommate Syd O’Brien and later Rich McKinney played third. A fish out of water in the outfield, Beltin’ Bill somehow did not let his hitting suffer. He’d go on to rank as the first Sox to win the American League home-run title with 33 in 1971, but the previous year arguably was better. In fewer games (141 to 150 in 1971), Melton also slugged 33 homers and drove in 10 more runs with 96, compared to ’71. He did not go back to third until after Chuck Tanner was named manager for the final 16 games of the ’70 season. Ernie Banks had even more on his mind than hitting on the road in 1966 when Leo Durocher shifted him to third base. Leo Durocher was renowned for odd defensive alignments with his Hall of Fame-bound lineup core. Grasping for straws in his first two months as Cubs manager in 1966, Durocher shifted Banks to third and Santo over to short — replacing then-light-hitting Don Kessinger. Done over a late May-early June road trip to Cincinnati and Atlanta, the shuffling permitting newly-arrived Lee Thomas and his lefty bat to play first. Durocher just disdained Banks’ lack of defensive range at first, so he did not return Mr. Cub to his old position at short. Santo, fresh from two straight Gold Gloves at third, was deemed defensively adept to take over at short. Neither all-time Cub was a rookie at their new positions. Banks, then established at shortstop, spent part of the 1957 season at third base while manager Bob Scheffing experimented with the proverbial good-field, no-hit shortstop in Jack Littrell. Santo was shifted over to short in some games in 1962 under the same chaotic College of Coaches regime that installed Banks in left field for a few games in 1961. Banks and Santo soon returned to their regular positions while Thomas had to seek platoon work in right field. 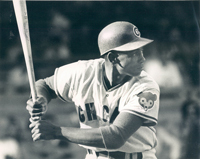 But Banks was back at third on an emergency basis in the first game of a June 26, 1966 doubleheader at Wrigley Field. Mets pitcher Jack Fisher beaned Santo under the left eye, breaking his cheekbone. Banks immediately shifted to third. He stayed at the hot corner for the nitecap with disastrous results, making three errors. Minor-leaguer Ron Campbell was called up to take over at third the next day. Santo proved his durability playing with Type 1 diabetes that could not be calibrated outside a doctor’s office in ’66 by returning to the lineup July 4, 1966 at Wrigley, slugging a homer in his first game back. Maybe Santo proved a bit too versatile for Durocher. After ignoring infielder Paul Popovich‘s switch-hitting bat and slick glove down the stretch in 1969, Leo The Lip inserted Popo at third and moved Santo to left to shake up the lineup at two junctures in 1970 and 1971. 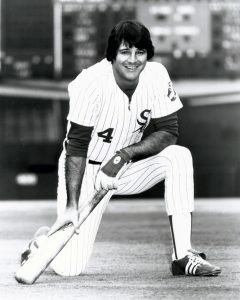 And when Santo was traded to the Sox late in 1973, Tanner asked him to play second so as to not disturb Melton at third. 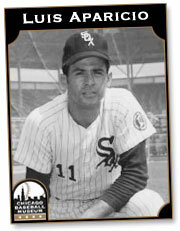 The unexpected move did not work out at all, with Santo retiring after one season on the South Side. Williams was the third Hall of Famer in the Cubs’ heart of the order who had to get a new glove. Establishing himself as a defensively capable corner outfielder after shaky work at the two positions in his NL Rookie of the Year season in 1961, Williams played a few games at first base near the end of his .333 batting-title season in 1972. The move enable both future AL stolen-base king Bill North — soon to be traded — and Rick Monday could both play in the outfield. Williams returned to first in Aug. 1973, amid a massive team hitting slump, to make room for Rico Carty, doing a cameo appearance in left before he was sent packing. And he became the regular at first to start the 1974 season after Jerry Morales was acquired to play left alongside Monday and Jose Cardenal in the outfield. Oddly enough, after recovering from spiking himself running across first base in late August of ’74, Williams finished out his stellar Cubs seasons in left field in late September. He became mostly a designated hitter in his final two years in Oakland in 1975-76. Carlton Fisk couldn’t have known in his first Sox season in 1981 he’d be in left field five years later. Williams had logged several seasons’ worth of time in right field in the mid-1960s. In June and July, 1969, he returned to right so defensively-challenged Willie Smith could play left until replaced in the late innings by Jim Hickman. And amid his greatest offensive season (42 homers, 129 RBIs) in 1970, Williams again shifted to right to accommodate first Santo, then near season’s end rent-a-hitter Tommy Davis in left. I wrote an e-book of alternate Cubs history in 2012 in which Williams volunteered to play right full-time so a sun-challenged Lou Brock — who is never traded in this timeline — could play left and concentrate on his hitting and base-stealing. circa 1964. Billy told me at the time I penned the book he’d have done that move if asked, hence the alternate scenario. Just recently, fishing buddy and Hall of Famer Fergie Jenkins said Williams was actually a good right fielder. He did not possess a Roberto Clemente rifle-style arm, but Fergie said Billy’s was accurate and always hit the cutoff man. Plus, he added, he was not bothered by the late-afternoon sun that bedeviled Brock. Moving back eight miles south, Pudge Fisk was fortunate the old Comiskey Park left field was not the sun field it presently is at G-Rate Field. Why would a Hall of Fame-bound catcher be shifted to left, or first? Well, more over-experimentation, this time by Sox manager Jim Fregosi. Fisk-in-left was a big storyline at the time, but it did not impact a Sox contender. Had it taken place, say, in 1983, the wandering-catcher-angle would have overshadowed the Winning Ugly narrative. And for you young managers out there, here’s were even more needless shifting could derail a career. Kenny Williams had a good rookie year playing center and right with 11 homers, 50 RBIs and a .281 average in 1987 for the Sox. For lack of a regular third baseman in 1988, Fregosi stuck Williams at the hot corner. He batted .159 and the first-year promise was never built upon. Williams would distinguish himself 17 years later in the executive suite, but you can be sure he’s never forgotten the tough times at an unfamiliar, demanding defensive position. “Jack of all trades, master of none” surely applies in baseball. But the sport is so crazy a Gold Glover may find himself at a position where his glove could only be made of iron.